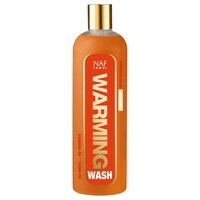 NAF Warming Wash is a no rinse body wash designed to warm and cleanse your horse after exercise on cold winter days. Containing Ginger and Clary Sage, the rinse will lift sweat and dirt with ease from your horse’s hair leaving a subtle warming fragrance that is both soothing and relaxing. The result is a happy horse who smells good too.